Have you run it with the Power Commander V yet? Bike needs a new battery, but I plan on doing a Dyno run when she is finished...so hopefully it will all work out, but I'll keep you posted. Just a dude, playing a dude, disguised as another dude. going to be one hell of a build! but where is the roadwing on that list of awesomeness? The bike is coming along nicely. And what Smokescreens said. No R* build is complete without a Roadwing. I'll never own another R* without one. Looks Good! I removed the power commander from my 08, would sputter in 4th & 5th at cruise. Good Luck! Thank you! Did not think I would need one for riding 1up. Also, running low on $$, but you are still selling them, right? A few more pics of the forks, springs, & gold emulators. How hard was it to drill out the dampers? I've got everything here waiting to go, but had a bit of a detour recently. Gold emulators are next to go in. I see you have an automatic punch; I just picked up one of those too, just for this job. I hope it helps. Lol, you still have to hit the mark with your eyes, that's not automatic. Sorry I can't be of more help, but my buddy is building this bike & I am keeping up on the build thread. If I talk to him soon I'll ask for you! I am probably going to want to go with of set of the "standard eyebrows," so I could dump that sissy bar. Please let me know if you can help me out. You might want to make a separate post and title it something like, "Looking for fender eyebrows". You'll get more eyes that way. The bike is looking great BTW. It looks like Ultrastar should be able to help out...what a great community of riders here! Right on. Glad to hear. And yes, this is a good bunch. Hows that SS Fender working out? Anyway to cover up that large gap between the fender and bags? Otherwise it is looking great so far! I am looking to build mine roughly the same as yours but don't want to spend baddad prices. As of now the Dchoppers bracket is not allowing the bag to sit with the rubber/bag protector, so they are just laying on it for now. I'll post pics for you when it is set and let you know what was done. 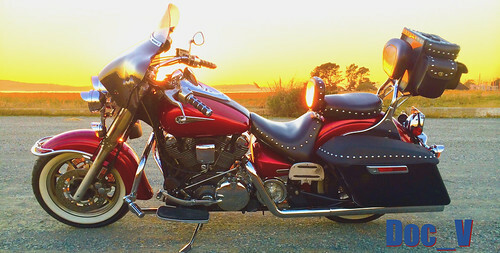 Fit For Harley Davidson Softail models 1984-2013（except softail slim, softail deuce models）. Black finishes mounting hardware. Our warehouses are in Rancho Cucamonga,California, United States. The real goods you receive;. Thats the same bracket I bought to use with TCMT extended bags. Haven't tried to mount them yet but I imagine they'll take a little bit of cutting to make fit. I found this guy on ebay that makes a roadstar specific kit. Said he would sell me just the fender since I already have the brackets and fenders for $239 + shipping. 3 bad reviews in the last month.